This is a 1/43rd scale diecast model of the BB512 LM as driven by C. Ballot-Lena, J.C. Andruet and H.Regou in the 1982 running of the Le Mans 24 hours. The car dropped out of the race after 5 hours, due to an unknown cause but most probably engine failure. 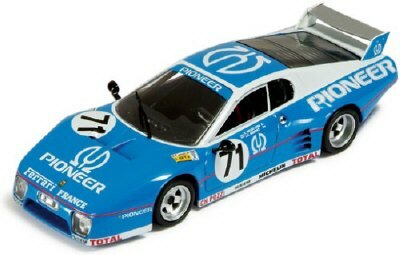 The model is issued by Ixo Models who concluded a deal with Hotwheels / Mattel (holder of the license to produce official Ferrari models) to produce 1/43 scale models of the more modern Ferrari range of automobiles.